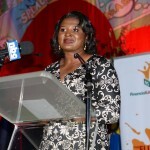 She has served on the Boards of large public and private sector companies as either Chairperson or Deputy Chairperson. She was awarded National Honours (Most Distinguished Order of Namibia) for ”outstanding contribution to the socio-economic development of Namibia” and was inducted into the Namibian Business Hall of Fame. She has also received numerous awards such as the Namibian Business Personality of the Year and Most Innovative Entrepreneur of the Year. She seeks to complement President Geingob’s declaration of war on poverty. She combines her professional expertise with her passion for enterprise development to focus on youth entrepreneurship and the integration of rural and urban economies. She also applies her energy towards projects relating to Maternal and Child Health Care, Early Childhood Development, Gender-Based violence and communicable and non-communicable diseases. She serves as UNAIDS Special Advocate for Young Women and Adolescent Girls. She launched the #BeFree movement in Namibia in November 2016, a non-judgemental, inclusive platform to encourage honest and robust dialogue and information sharing on matters which stand in the way of young people being free (with a focus on AIDS). This conversation will be moderated by Professor Rita Abrahamsen, Director of the Centre for International Policy Studies.